With Take a Hike Day upon us, rather than driving up into the mountains for a hike, here are three easy urban hikes in Denver. Great for kids, visiting family, and everyone else who loves to hike, these three easy hikes near Denver invite everyone out for a great time. These hikes help tourists and visiting friends adjust into and acclimate to our Denver altitude, too! Be sure to click the hike title for an interactive map. Norfolk Glen Loop. The Norfolk Glen Loop in Aurora combines the best of the outdoors with the ease of two great trails, the Sand Creek Greenway and the High Line Canal Trail. 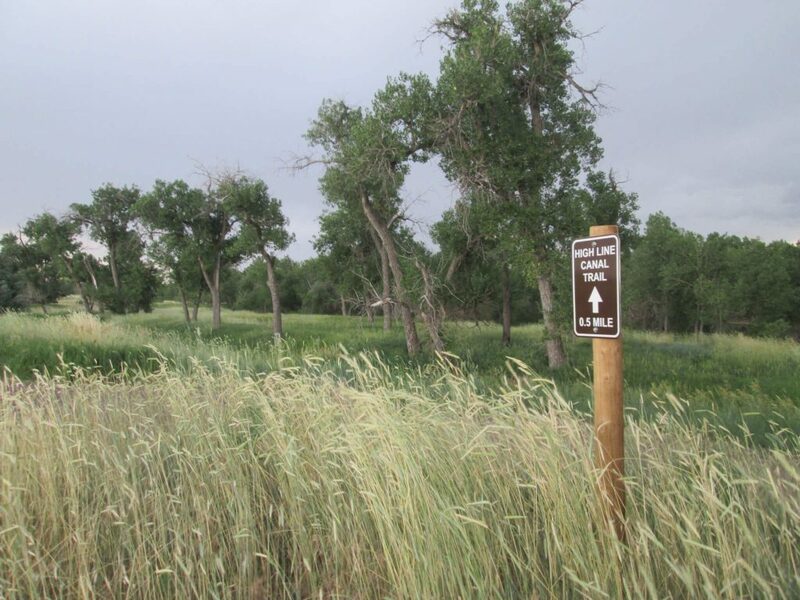 At five miles, which you can shorten to just over three, this hike starts at the Star K Ranch Morrison Nature Center off Smith Road (16002 E. Smith Road, Aurora 80011). You walk through wonderful open space filled with deer, elk, coyotes and prairie dogs. 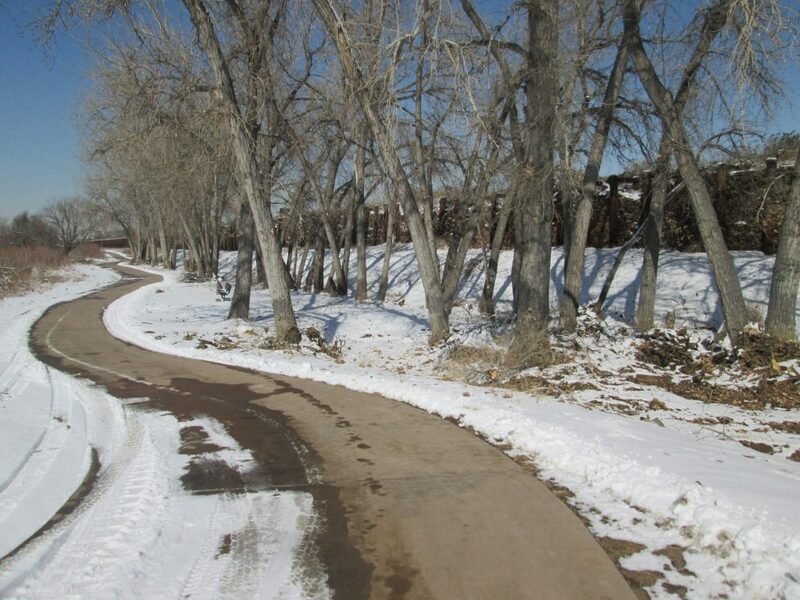 You’ll cross the Sand Creek onto the High Line Canal Trail, and walk for a couple of miles with the Canal on your right and open space full of hawks and eagles on your left. After navigating the Triple Creek Trailhead, you’ll head back along the Sand Creek and its Greenway on soft surface trail. When you arrive back to the Nature Center, be sure to go inside to use the restrooms and enjoy the interpretive history about Mr Stark. For the kids, they can touch some animal furs, too! The Stapleton Central Park Loop. At three miles, all housed within Stapleton’s Central Park, you can follow the map, or just get lost meandering the trails between Central Park and Westerly Creek Park. Within the loop, you’ll find a fantastic playground for all ages that includes rock climbing and bouldering. Don’t miss the beautiful Alzhiemer’s Remembrance Garden, and be sure to walk out onto the overlook. 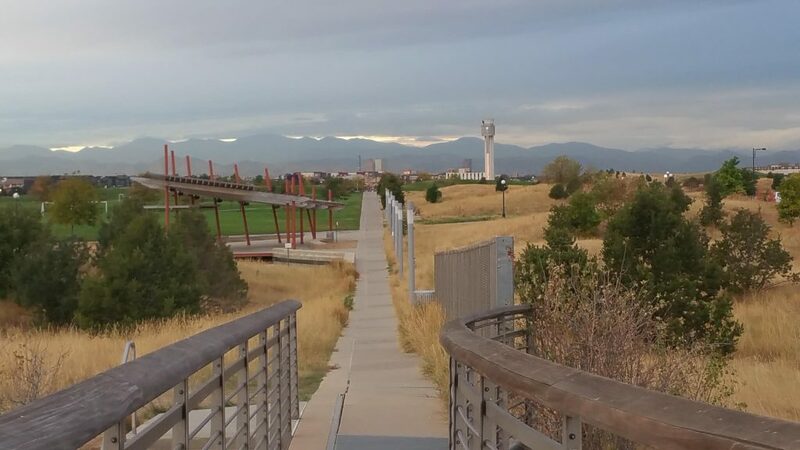 This “bridge to nowhere” is actually a piece of artwork designed to connect the old Stapleton airport with the new. It diagonally points from the old air tower just to the west to the new air tower to the northeast. Regardless of which way you walk this loop, the views are plenty. The Confluence Loop. 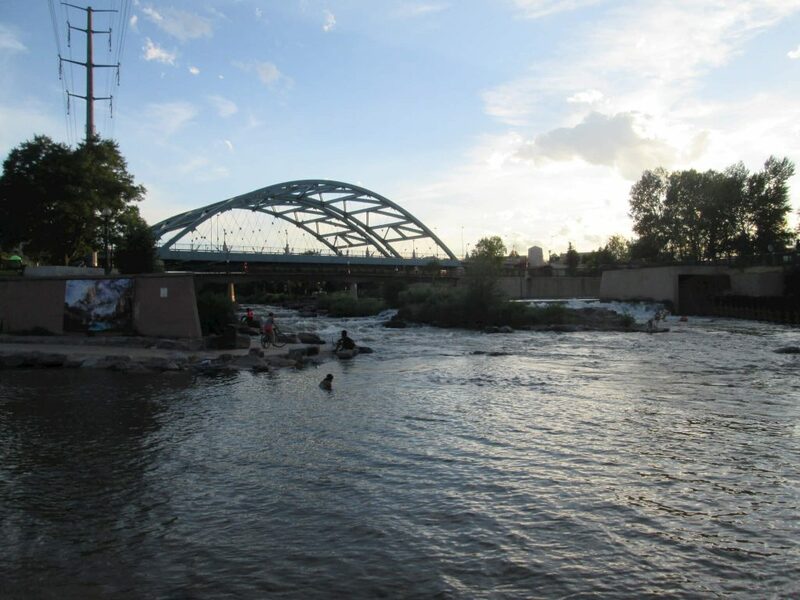 A great hike for locals wanting to show off Denver, this hike starts at REI at Confluence Park. You’ll walk along the Platte River toward Mile High Stadium, cross the million-dollar bridge, then enjoy the swoosh of Elitch’s roller coasters. Pass the City of Denver’s Centennial Garden, then you’ll take a right and amble along Cherry Creek. Here, you can see where Denver and Auraria were founded while enjoying some great urban art. The walk continues along the Platte River to Denver’s Skatepark, which is continually ranked in the top 10 free skate parks in the world. If you’re ambitious, you can extend this three miles walk over the Millennial Bridge and drop into Union Station for lunch. Have you walked any of these loops? Which was your favorite? And thanks for supporting me and the Leukemia Society.